Elements of Peeping Tom, Network, Taxi Driver and a powerhouse performance by Jake Gyllenhaal are all fused together by veteran screenwriter Dan Gilroy in his directorial debut, the jittery, sleazy Nightcrawler. A gaunt-looking Gyllenhaal plays Louis Bloom, a twitchy bottom-feeder with aspirations, but for what? Even he's not certain. 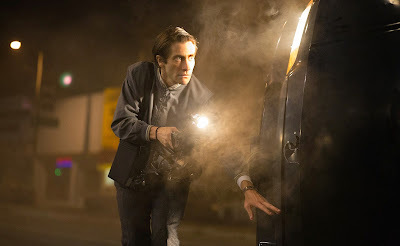 At the start of the film, he is busted by a security guard as he steals copper wiring, scraps of metal, and even the guard's wristwatch after he manages to overpower the man. But a transaction for the stolen items sets Bloom on a different path after his polite eagerness isn't enough to convince the buyer to overlook his thievery and hire him, even for free. Before long Bloom has a chance meeting with Joe Loder (Bill Paxton), a scumbag who scans police airwaves to arrive first on the scene and shoot video he sells for top dollar to bottom-rated KWLA's news team. The entrepreneurial Bloom is soon teaching himself how to shoot and edit ratings-grabbing news packages for KWLA's ambitious director, Nina Romina (Rene Russo). 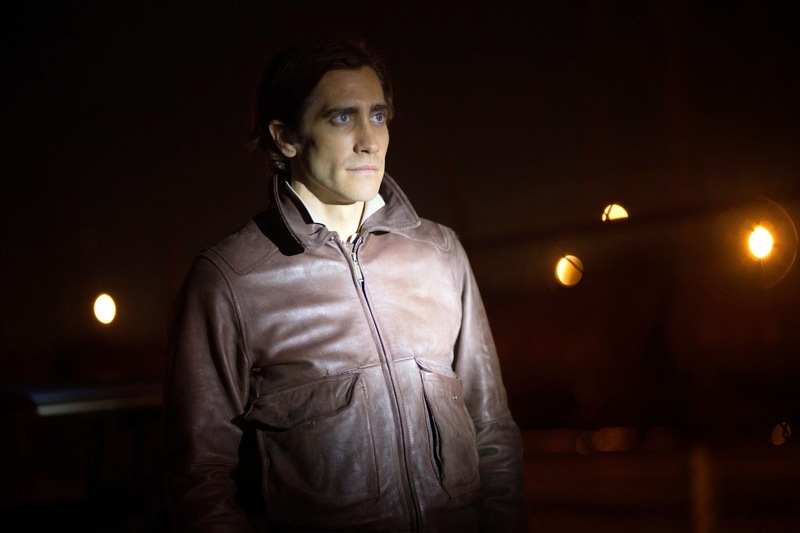 Bloom is Travis Bickle 2.0, an obsessive who lives on the fringes of society observing its disintegration. But Bloom isn't motivated with saving anyone. He just wants to capture the grimy nihilism on camera. Bloom wears his sociopathy on his sleeve, proudly admitting that any empathy a normal person might possess is simply not there. "I like to say, if you're seeing me you're having the worst day of your life," says Bloom. In his line of work, it's a mark of distinction. 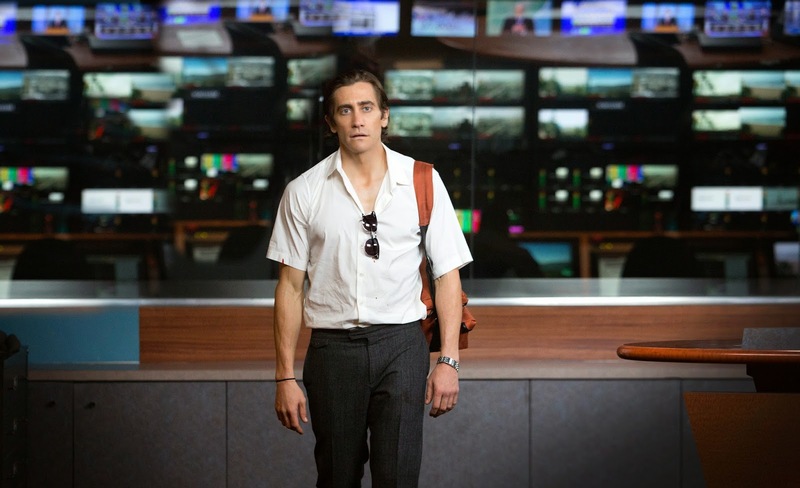 Gyllenhaal uses his skeletal physique to emphasize his greatest feature, his large, all-seeing eyes, and to call attention to Bloom's gnarly inhumanity. Bloom looks like a better dressed Gollum, hunched but agile, creeping his way through the darkened streets of Los Angeles's best neighborhoods in search of stories worth selling to Nina. What is she looking for? "The best way I can describe it, Louis," Nina says, "is to think of our news as a screaming woman running down the street with her throat cut." Bloom takes that description to heart, as well as Loder's reminder of a well worn reporter's refrain, "If it bleeds, it leads." Gilroy presents Nightcrawler in such a way that he implicates the audience itself in Bloom's unethical pursuit of the next great shot. 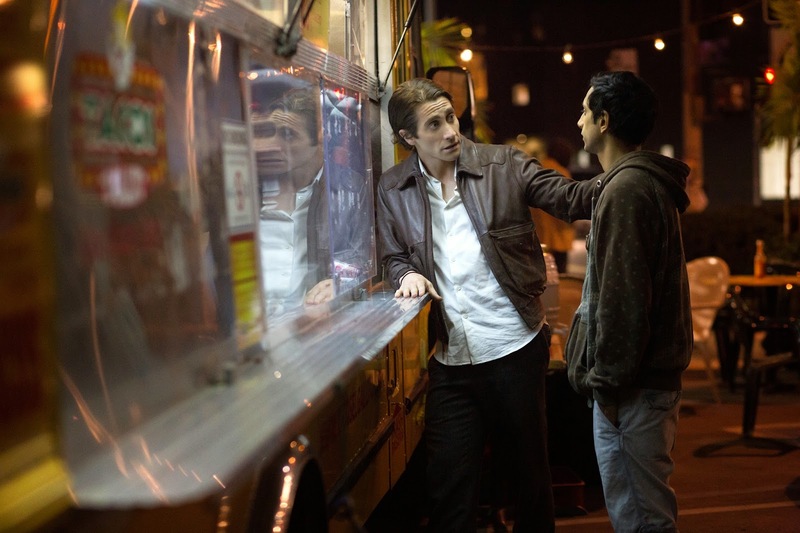 At times, cut as frenetically as a typical broadcast montage Nightcrawler culminates in an exceedingly questionable ethical compromise when Bloom arrives at the scene of one triple homicide before the police do. Rather than help one victim who is still breathing, Bloom decides to get as much footage as he can, including some of the assailants themselves which he withholds for his own grand scheme of getting ahead in the cutthroat business of news-gathering. Through a number of point-of-view shots, Gilroy places the viewer in Bloom's position, inducing a jolt of adrenaline in the audience the kind of which fuels Bloom's voyeuristic interloping. While Bloom doesn't directly harm his camera subjects the way Carl Boehm's killer photographer did in Michael Powell's Peeping Tom, Gilroy manages to associate the moviegoer's thrills with Gyllenhaal's in much the same way as Powell did in his movie. It's all enabled by Nina. Once a star reporter in her own right, age has taken her out from in front of the camera. Behind the camera, though, she is just as hungry a shark as Faye Dunaway's Diana in Network. Initially, one's sympathy may lie with her when Bloom decides to leverage her dependence on him for scoops and ratings for a sexual relationship in return. But if anyone is cutthroat enough to understand the schizoid Bloom, it is Nina, a woman whose fading looks have forced her to be a survivor in an industry where the packaging is more important than the content. Bloom himself is a byproduct of just such a society, hiding his vicious intentions behind his eager beaver demeanor and the utterance of self-help aphorisms that promulgate and justify a capitalistic, dog-eat-dog mentality. When one character finally realizes the depth to which Bloom will crawl in the detritus of human rubble—at one point even dragging a body ejected from an automobile into the light in order to get a better shot—it is too late for one to disavow him. Bloom is the embodiment of the kind of detached anonymity modern times have bestowed on us all. In this respect Bloom is not like Taxi Driver's Bickle at all. Bickle's resentment grows from the dissonance between what he once believed American society represented and what it is now. He thinks he is some sort of savior who can turn it all around if only he could just make a connection of a personal kind. Bloom is considerably more self-aware. "What if my problem isn't that I don't understand people," he says, "but that I don't like them." 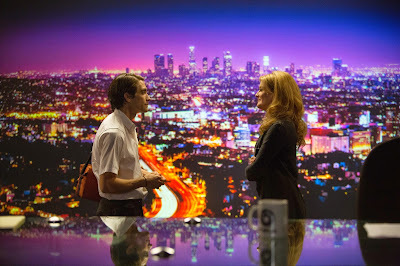 It's a powerful moment in Nightcrawler that demonstrates Bloom's callousness and crystallizes to what extent he isn't even a hero in his own mind. wow...this sounds intense. i can't wait to see it.